5 left in stock. Order now for immediate despatch. 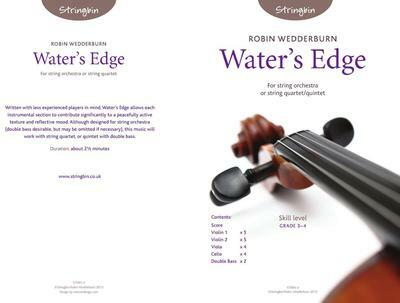 Written with less experienced players in mind, Water's Edge allows each instrumental section to contribute significantly to a peacefully active texture and reflective mood. Although designed for string orchestra (double bass desirable, but may be omitted if necessary), this music will work with string quartet, or quintet with double bass. Duration: about two-and-a-half minutes. What do you want to know about Water's Edge?